1956 British Hit Parade - The B Sides Part 2 Jul.-Dec.
Acrobat’s British Hit Parade series has been established for well over a decade as a unique range of completist original artist collections comprising every record that appeared in the UK record sales charts in every year since the charts began in 1952. In recent years Acrobat has introduced parallel collections which consist of the B sides of all the records included in the main compilations, and these have proved hugely popular with collectors, since many of the records concerned have never been available on CD and are very rarely heard. This 4-CD set is the second of two companion products to our existing 1956 British Hit Parade Parts One & Two (ACQCD7024 & 7025), and features the B sides of the tracks on Part Two of those collections those anthologies, excluding the ones which appeared on the original collection as Double A-side hits. 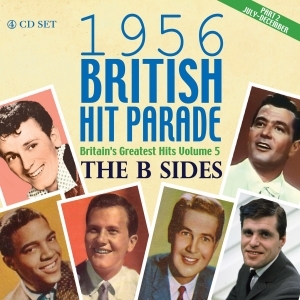 It also includes the B sides of relevant records which were chart entries in the Melody Maker, Record Mirror and Record Retailer charts, and which were not included in the original sets, but appeared later on our “1950s British Hit Parades - The Hits We Missed” collection (ADDCD3078). As ever, it’s an eclectic snapshot of an ignored but fascinating aspect of the pop business, including in-depth 10-000+ word booklets with background notes on every record.